A 40-year tug of war between oil wells and caribou in Alaska’s Arctic National Wildlife Refuge could soon end with active drilling in one of the most fragile ecosystems in the world. 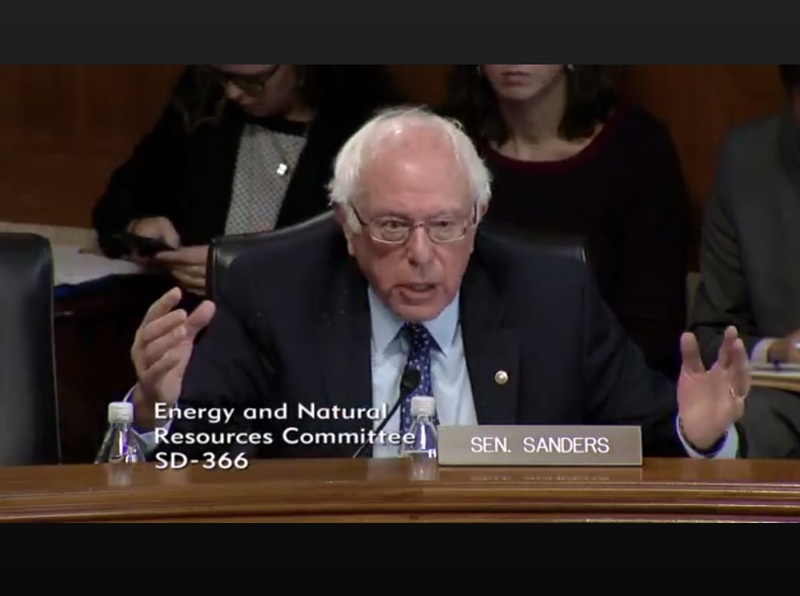 Sen. Bernie Sanders, I-Vermont, argues that the focus should be on climate change, not more oil. The Senate Committee on Energy and Natural Resources endorsed legislation yesterday that would require the federal government to sell leases for at least 800,000 acres of land over the next decade. The measure, which divided Republicans and Democrats in the committee, could pass the full Senate with a 50-percent vote as part of a budget bill. The committee discussion, shown in the video on this page, was quite revealing, as Democrats offered amendments to the Republican legislation. The hearing begins 24:05 minutes into the video. The committee chairwoman, Sen. Lisa Murkowski, a Republican from Alaska, said developing oil wells in the northern part of ANWR was always the intent of the 1980 law that expanded the wildlife refuge. The drilling could generate more than $1 billion in federal revenues over the first 10 years, according to the Congressional Budget Office. Murkowski said oil development will create thousands of good jobs, keep energy affordable, reduce foreign oil imports and ensure national security. Drilling is supported by Alaskans of all political persuasions, including most public officials, she said. Murkowski insisted again and again that the environment would be protected during any future oil production. No environmental laws would be waived, she said, and new oil-drilling technology will allow a much smaller footprint of development than in previous drilling projects in Alaska. Democrats, led by Washington Sen. Maria Cantwell, the ranking Democrat on the committee, voiced indignation over the language in the legislation as well as the idea of drilling in a wildlife refuge. Even though the legislation leaves the door open for environmental reviews — including an assessment of harm to endangered species — it clearly mandates drilling, regardless of the damage to any species or their habitats, the Democrats maintained. Attorneys for the committee concurred in that assessment. In fact, the new legislation would the alter the original law that created the wildlife refuge by adding a new purpose: oil production in the 1.5-million-acre northern region, known as the 1002 Area. Leased areas would essentially become a petroleum preserve, governed by the National Petroleum Reserve Act. If approved, the legislation would remove lands to be developed from the jurisdiction of the U.S. Fish and Wildlife Service and put them under the Bureau of Land Management. Cantwell mentioned a letter signed by 37 scientists familiar with ANWR who objected to oil exploration and development in the refuge. They raised concerns for the wildlife that occupy the coastal plain where drilling is proposed. Other Democratic and Independent senators on the committee also spoke out forcefully against the measure. Sen. Bernie Sanders, I-Vermont, raised the issue of climate change and the hundreds of billions of dollars that the U.S. must spend because of more intense storms and hurricanes. In that context, the $1 billion to be raised from ANWR is insignificant, he said. “What this committee should be doing, working with people all over the world, is saying, ‘How do we transform our energy system away from fossil fuels, away from coal, oil and gas to sustainable energy?’” he added. Sanders’ comments come at 2:02:38 in the video. Heinrich’s comments come at 2:17:30 in the video. Information about the legislation can be found on the website of the Senate Committee on Energy and Natural Resources. Brown bears are still actively fishing at Brooks Falls in Alaska’s Katmai National Park and Preserve. I wish I had more time to sit and watch them, as there is almost always something going on at this time of year — although the salmon run is expected to decline soon. See live video from three cameras on Explore.com. For this and other live wildlife cams from across the country, check out my “Amusing Monday” blog post in Water Ways from June 29. The beautiful and powerful brown bears have arrived at Brooks Falls in Katmai National Park and Preserve in Alaska, and everyone in the world can enjoy the convenience of watching these giant bears and other amazing wildlife live from the comfort and safety of their home. Brooks Falls is one of the first streams in the region where the bears have easy access to bright salmon soon after they leave the saltwater and before spawning. The falls provide a partial barrier to their travels, making fishing easier for the bears. By sometime in August, the fish runs will dwindle and the bears will be gone. Operators of the multiple live webcams do a good job of zooming in when something interesting happens. Occasionally, so much is going on that they don’t know what to show. Other times, we wait and watch the beautiful scenery, which is especially dramatic at sunrise and sunset. When the bears are actively fishing for salmon, I find it hard to break away and get back to daily life. One video trick I’ve learned: If you don’t see anything interesting in the live view, you can use your cursor to scan across the timeline to see what has happened for the past few hours and watch that instead. Park officials have identified the various fishing methods used by the bears in an interesting Q&A section on the national park’s website. Besides watching bears, it’s a good time of year to watch other wildlife as well via live webcam. Birds are typically active on their nests, raising their young. Chesapeake Conservancy is featuring the osprey couple, Tom and Audrey, who perennially nest on Kent Island in Maryland. Audrey has taken up with a new “Tom” this year and produced three babies. They also received two foster chicks from nearby Poplar Island, according to information on the website. Another good osprey cam was installed this year in Belwood Lake Conservation Area near the Great Lakes in Ontario, Canada. Three eggs reportedly hatched, but I see only two chicks in the nest. Washington Department of Fish and Wildlife also has an osprey cam that updates still photos every 12 seconds. A puffin cam at Seal Island National Wildlife Refuge in Maine shows a fuzzy chick tucked into a burrow where its mother comes and goes to feed her baby. Other views shows puffins on a ledge where they often hang out. Wildlife biologists are trying to establish a new colony at this location after hunters wiped out the puffins in the 1800s. Another live camera on Seal Island shows a guillemot in a burrow. If you would like to see a colony of walruses, (also in video player below) check out the live camera installed on Round Island, Alaska. Sometimes only a few of the large mammals can be seen. Other times, like this morning, large numbers were pushing and shoving each other for space. The comments are often entertaining. If you are interested in more live cams of wildlife, check out last year’s Water Ways entry from June 23, 2014. Meanwhile, the Seattle Aquarium is featuring live cams from its displays of harbor seals and sea lions. A salmon cam in Alaska’s Steep Creek is showing fair numbers of sockeye swimming upstream near the Mendenhall Glacier near Juneau. The U.S. Forest Service, which placed the camera (at right), says the sockeye are likely to be visible from mid-July through August. If you’re lucky, you may see the sockeye pairing up and possibly even digging redds for their eggs. Adult sockeye tend to average 24 inches long in Steep Creek. Besides sockeye, you may see cutthroat and Dolly Varden trout in the creek. You may also see young coho salmon swimming by. The camera is managed by Forest Service officials in Tongass National Forest. If you recall, I listed several wildlife cams in a June 17 entry in Water Ways. At the time, a pair of ospreys was raising three young chicks. Take a look now at the ospreycam; the babies are almost as big as their parents. Where is the oil hiding, besides offshore locations? President Bush has lifted the executive moratorium on offshore oil development. Now it is up to Congress to decide whether to shift the decision on offshore drilling to state governments for state-by-state decisions. See Ben Feller’s story for the Associated Press. Meanwhile, there is a lot of political heat generated over the “use-it-or-lose-it” bill proposed by the Democrats in Congress, who argue that offshore drilling shouldn’t be approved until known onshore reserve areas are explored. The bill won’t go anywhere, because Democrats don’t have enough votes to override a presidential veto. See Andrew Taylor’s story today for the Association Press. So what about offshore versus onshore drilling? Approximately 60 percent (165.9 million acres) of the federal land is inaccessible. Based on resource estimates, these lands contain about 62 percent of the oil (19.0 billion barrels) and 41 percent of the natural gas (94.5 trillion cubic feet). Approximately 23 percent (65.2 million acres) of the federal land is accessible with restrictions on oil and gas operations beyond standard stipulations. Based on resource estimates, these lands contain 30 percent of the oil (9.3 billion barrels) and 49 percent of the gas (112.9 trillion cubic feet). Approximately 17 percent of the federal land (48.0 million acres) is accessible under standard lease terms. Based on resource estimates, these lands contain 8 percent of the oil (2.3 billion barrels) and 10 percent of the gas (23.6 trillion cubic feet). See the news release OR the report itself. Meanwhile, the BLM yesterday announced its decision to open for exploration and development about 2.6 million acres of potential oil lands in northern Alaska. The “record of decision” puts off final conclusions about another 600,000 acres north of Teshekpuk Lake, which includes habitat for caribou and migrating birds. Tom Lonnie, Alaska state director for the Bureau of Land Management, was quoted by Felicity Barringer of the New York Times as saying the decision will allow drilling in an areas that holds some 3.7 billion barrels of oil. For a reference on the amount of oil these figures represent, the United States goes through about a billion barrels of oil in 50 days. See the Energy Information Administration.